HONG KONG, Apr 26, 2018 - (ACN Newswire) - Ching Lee Holdings Limited ("Ching Lee Holdings" or "the Company", stock code: 3728.HK) is pleased to announce that the Company has signed a collaboration agreement with Wing Shing Land Investment Limited ("Wing Shing Land"), which is owned by the experienced investor Mr. 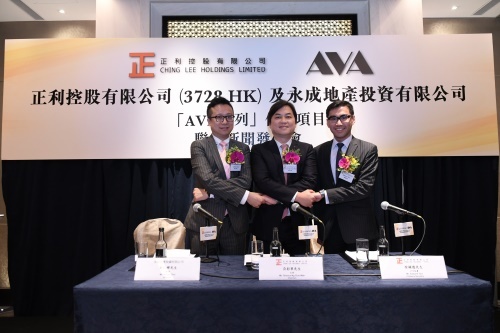 Lo Wah's Family Group, to buy shares of the residential project of "AVA" series. Both parties will establish a long-term collaboration partnership in accordance with the agreement. The Chairman of Ching Lee Holdings Limited, Mr. Ng Choi Wah and the Manager of Wing Shing Land Investment Limited, Mr. Choi Yan Fai participated in the joint press conference today (26th April) to elaborate on the project mentioned, and to introduce the future development of the Company. The residential project of "AVA" series this time is located in the area of Tai Nan Street, the section between Nam Cheong Street and Shek Kip Mei Street of Sham Shui Po. Being at the center of West Kowloon district, such project is the fourth one of the series to be located at Kowloon. The well-connected transportation in the district, as well as the abundant choices of restaurants and shops conveniently located in the area, are going to be the important success factors in the project. Besides self-use purpose, the rental potential is also significant, and thus it is expected to be popular among first-time buyers and investors. The project will be a single block boutique residential development and will mainly be small unit apartments. It is expected to be launched to the market as early as the second half of this year. According to Mr. Ng Choi Wah, the Chairman of Ching Lee Holdings Limited, it is an honor and pleasure to collaborate with Wing Shing Land Investment Limited, which is owned by the experienced investor Mr. Lo Wah's Family Group. Wing Shing Land has an eye for property investment, marketing, and always strive for high quality. All of these match with the business advantages and philosophy of Ching Lee Holdings. The Company will further enhance the partnership with Wing Shing Land to diversify the business. The investment in "AVA" series signifies another key milestone for the Company. It is the first time the Company has set foot in the property investment market. The support from Mr. Lo Wah's Family Group has exerted highly positive influence towards the long-term development of the Company. Mr. Ng also mentioned, the Company is fully confident about the outlook and the prospects of the construction market in Hong Kong especially the boutique apartment market and will continue to participate in such market with an aim to expand its business of real estate investment in the coming future. Meanwhile, the Company believes that it is well positioned to expand its market share and maintain its active status in the construction main contracting industry in Hong Kong. The Company is committed to providing better services to the citizens and create higher investment return for the shareholders. According to Mr. Adrian Choi, Manager of Wing Shing Land Investment Limited, Wing Shing Land has previously launched a number of boutique residential projects in the urban areas of Hong Kong and has enjoyed a high popularity in the market. Based on the huge demand for apartment purchasing, the "AVA" Series Project is expected to attract the market again. Wing Shing Land gives high affirmation towards the service quality of Ching Lee Holdings by regarding the Company as a listed company and a guarantee of confidence on quality control and corporate governance. In addition, the professional consultancy advice to be provided by Ching Lee Holdings at an early stage of the project is highly beneficial for the overall project development. By the strategic cooperation with Ching Lee Holdings, Wing Shing Land hopes to establish a long-term and stable relationship with the Company for the upcoming projects with an aim to provide high-quality products for the Hong Kong citizens. Ching Lee Holdings Limited is a main contractor in Hong Kong and listed on the Main Board of the Stock Exchange of Hong Kong Limited (stock code: 3728). The Company was founded in 1998, providing services ranging from substructure building works, superstructure building works to RMAA works (repair, maintenance, alteration and addition works services). The Company has an experienced and dedicated management team with extensive knowledge of the construction industry and project management experience in the services that it provides. The broad know-how and industry knowledge of its management team will allow the Company to continue providing its customers with high-quality service. In March 2016, Ching Lee Holdings Limited was listed on the GEM board in the Hong Kong Stock Exchange and transferred to the main board in September 2017. The Company's business has been developing stably since it was listed and the revenue of 2017 has increased by 22% as compared with 2016. For further information about Ching Lee Holdings, please visit the Company's website at http://www.chingleeholdings.com. Wing Shing Land Investment Limited is a subsidiary of the experienced investor Mr. Lo Wah's Family Group. The Group has been rooted in Hong Kong's real estate investment market for over 50 years and the projects it was involved covers broad categories, including M&A of apartment, commercial building, industrial building, shop, mansion and old building, etc.